At the moment there seems to be a glut of plump little Romanita tomatoes. Those beauteous little red globes are at their sweetest right now and I could just stuff a couple into my mouth each time I walk past a bowl of these scarlet gems. It’s almost as though they are beckoning me. And who am I to argue? Especially seeing as there are some great prices on offer right now. Woolworths has a 1kg pack of Rosas available at a fairly decent price and Food Lover’s Market has a special running on 3 x 500g of ZZ2 Romanita tomatoes. With only momentary flickers of sunshine making an appearance every week, it seems as if summer is still a while away. I’d just love to tuck into a great big salad, slathered with these little red babies and a light dressing. But though it may not be salad weather yet, I thought I’d take advantage of the great prices available and preserve a few bottles for later. 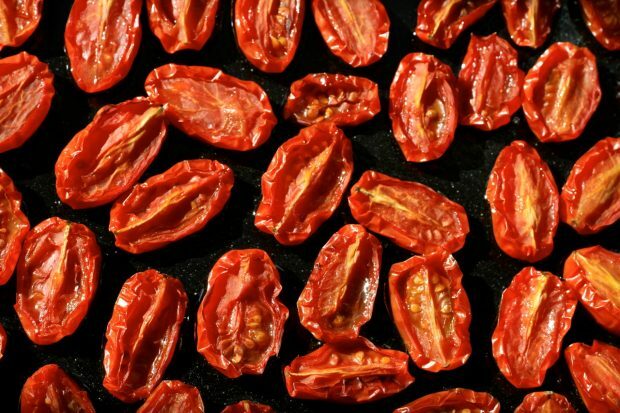 I love sundried tomatoes so I decided to go with oven drying the Romanitas. A huge big tray of them, slowly roasted in a very low oven. And it’s so easy. 1. Preheat your oven to 100 degrees Celsius. 2. 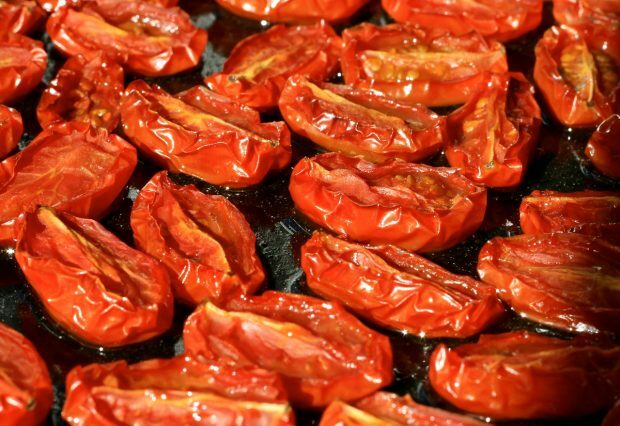 Cut the tomatoes in halves and place them cut side up, tightly packed, into a roasting pan. 3. Sprinkle them lightly with some coarse salt and 2 teaspoons of castor sugar, then drizzle a little olive oil over the top. 4. Bake for 3 to 5 hours (depending on how dry you’d like your tomatoes) and check after each half hour. 5. Pack into sterilised bottles and fill with olive oil to cover, making sure you’ve released all the bubbles by using a wooden skewer and lightly tapping the bottle on a board. P.S. Once opened, keep the bottle refrigerated and take it out of the fridge a little while before using or serving. Now this is where the genius in you comes out. You can add garlic, chillies, feta cheese, basil, mixed herbs, lemon rind or whatever your imagination will allow. 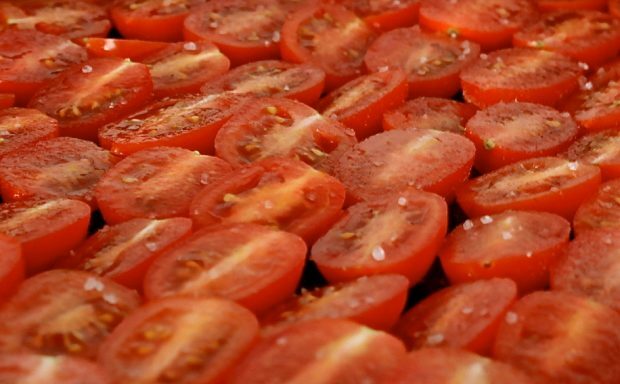 No matter what your choice, there are so many ways you can use these tomatoes: in a salad, over chicken, as part of a tapas tray, with steamed green beans, you name it. Apart from this, the oil itself can be used in your everyday cooking or in a salad dressing as well. These tomatoes are so versatile that you’ll be making them over and over. We made ours with layers of tomatoes, sliced chillies, lemon rind and, right near the top, a layer of (super smooth and creamy) feta cheese that we rolled into little balls. We used about 750g of Romanitas which (together with the feta, chillies and lemon rind) filled a 500ml canning bottle. There are so many other things you can do with tomatoes too. Why not rustle up a tomato pasta sauce, which can be frozen, or tomato jam, which will keep for ages? If you have any other ways of using tomatoes, please share them with us in the comments below. We’d love to hear from you! Agreed – you make it sound so much easier than I imagined. Definitely going to use this to preserve our excess tomatoes from the garden. Thank you so much for sharing.